1. 300 gram of shoulder cut meat should be thinly cut and seasoned. 2. Mix 0.5 units of sugar, 0.5 units of minced ginger,2 units grated onion, 2 units of water, 2 units of cooking wine and 1 unit of clear to make seasoning sauce. 3. Put oil on the heated pan and cook the shoulder cut meat until it’s cooked to about 80%. 4. After adding seasoning sauce, reduce the meat in low heat. Each chicken piece must first be dipped into the egg yolk and then in cornflour. The oil should then be heated until 190 degree Celsius. After the oil is hot, fry the chicken pieces for about 5-6 minutes, until crispy with a slightly golden colour and cooked throughout. The fried chicken is to be drained on a plate covered in kitchen roll. Mix together and stir the soy red wine vinegar, chicken stock, soya sauce, tomato paste and sugar. Cook it for 2 more minutes. Add cornflour slurry to the mixture. Keep stirring and cooking until the sauce thickens. The pineapple and the chicken must be stirred in the pan until fully coated in the sauce. Serve the chicken with hot rice. This is a vegetarian dish that originated in Punjab. 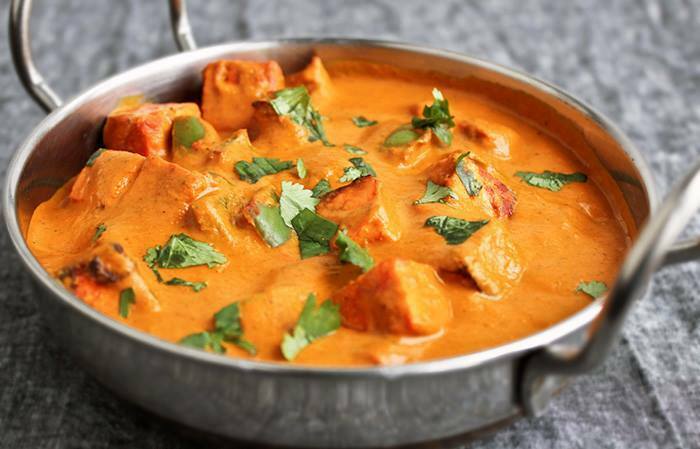 The primary information about cooking this recipe is that the paneer cheese is cooked in a creamy and spicy sauce. The butter in the title is apt because this recipe does need a buttery sauce which beautifully enhances the taste. For making the tomato-cashew spice paste, coat pan with butter ( in a little excess) and add the onions then add ginger and garlic paste. Sauté this mix for 2-3 minutes. Next add the tomatoes and cook until most of it’s moisture evaporates. 4. Next add the cashew nuts and sauté on low flame for 2-3 mins. Once this mixture has cooled down, grind to make a paste. 5. In another pan sauté the whole spices followed by the powdered spices. Let them cook for 2-3 minutes while constantly stirring. Add the tomato-cashew paste to this mixture and mix them well. 6.The last step is to add the paneer to this butter masala paste followed by water and cream. Garnish with kasuri methi.